November is in full swing and the Rockman Unity mobile app has kicked things off with a brand-new mobile wallpaper. 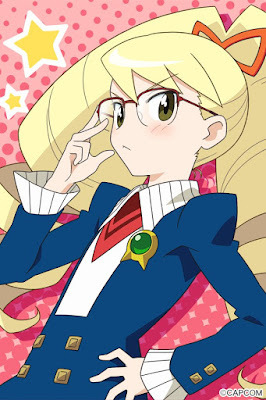 The spotlight shines on Star Force's "prez" Luna Platz. Thanks to Replod 21XX for the rip! girls with glasses make everything better. Ugh, she was just insufferable. Typical overly nosy fangirl type. No thank you. You probably played only halfway of the first starforce. Oh grow the hell up. I was referring to the anime. If you get triggered from a non-agressive comment, then you should be the one who needs to grow up, my dude. Who said I was triggered? My comment was completely normal in tone. And I'm not "your dude", so knock that off please. Hell yeah, best Starforce girl. plz, reupload the images, links down!